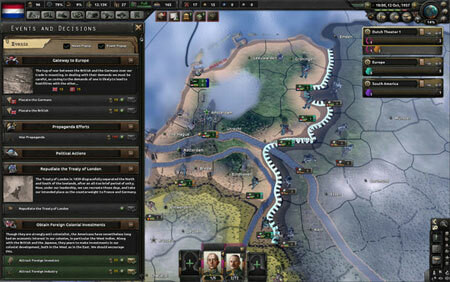 Hearts of Iron IV: Man the Guns is a World War II strategy simulator from Paradox Development Studio, a new expansion to Hearts of Iron IV. Design your own ships and refit older models. Alter your convoy routes to avoid hungry wolf packs. Embrace or circumvent naval treaties and deal with the diplomatic consequences. This expansion introduces new alternate history paths for the major democracies of the war and gives the freedom loving nations of the world more freedom to act before the war forces their hand. If you get stuck in the game, check out the video walkthrough and gameplay for the game. This entry was posted in PC Games, Walkthrough and tagged Hearts of Iron IV: Man the Guns Cheats, Hearts of Iron IV: Man the Guns Gameplay, Hearts of Iron IV: Man the Guns Guide, Hearts of Iron IV: Man the Guns Strategy, Hearts of Iron IV: Man the Guns US UK Focus Tree, Hearts of Iron IV: Man the Guns Walkthrough by Marvin. Bookmark the permalink.